From “The Classical Reviewer,” December 7, 2014. Read the whole thing here. 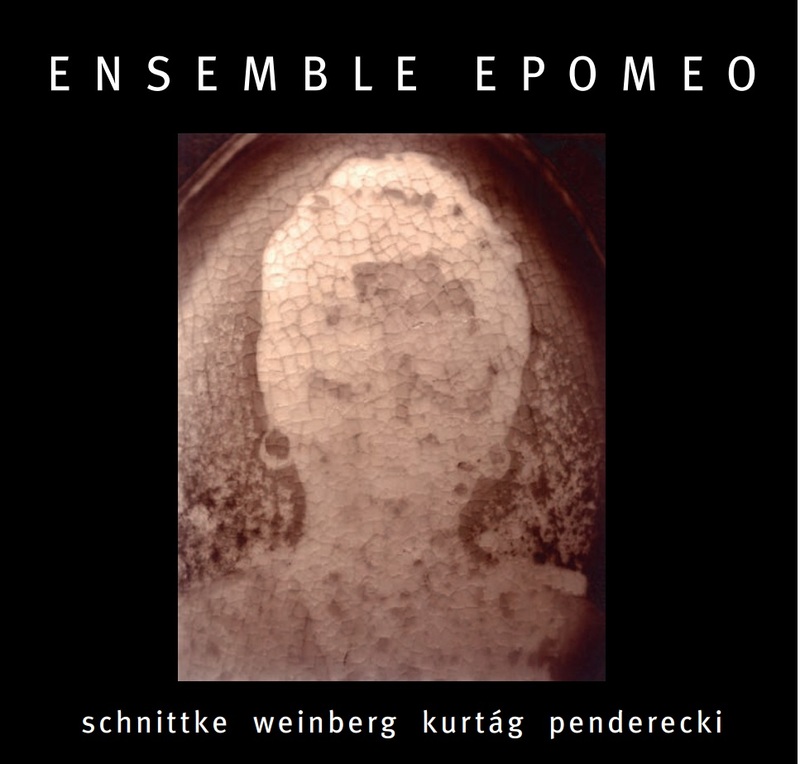 Ensemble Epomeo released their debut recording for Avie Records www.avie-records.com in 2012 featuring the complete string trios of Hans Gál and Hans Krása which received critical acclaim includingCritic’s Choice from Gramophone Magazine. Alfred Schnittke (1934-1998) wrote his String Trio in1985. The Moderato opens with a melancholy, dissonant theme before developing moments of intense passion Ensemble Epomeo really bite into the more anguished phrases often with the strings thrusting forward with frenetic energy. Occasionally the music reveals an almost classical style with a lovely little passage that is soon attacked by an outburst of ferocity. There are anguished dissonances that are exceptionally realised by this trio. An insistent falling passage arrives just before the little classical theme again peers through and the music slowly fades. The Adagio picks up on the descending theme and inverts it as the movement gently and quietly develops. A ghostly motif is shared around the trio and quietly decorated with some striking unison chords. Soon the violin holds a note under which the viola and cello intone a darker theme. A hushed wistful theme appears, offset by a passionate motif that bursts out fervently but the mournful, dissonant theme returns between outbursts with a slow melancholy tune appearing a number of times before the music fades at the end. A few weeks after the premiere, Schnittke suffered his first stroke. This is music that really tears at the soul, particularly in this performance. Mieczysław Weinberg’s (1919-1996) String Trio dates from 1950. The Allegro con moto rises up gently in an attractive little theme on the cello with occasional pizzicato accompaniment, developing and slowly becoming more passionate. The music moves through some very fine passages, building each time as it becomes more and more dramatic, the gentler theme always retuning. The music develops a rather Jewish lilt before winding to a hushed coda. The Andante opens with a gentle flowing theme that is expanded as it is shared around the trio in a kind of fugue, with these players weaving a lovely melancholy tapestry. There are moments of exquisite sensitivity in the little hushed sequence where some ghostly harmonies appear before leading to a beautifully hushed coda. A rhythmic theme opens the Moderato assai with a steady and rather grotesque dance. A wistful tune is then weaved around it on the viola, becoming more and more dynamic and insistent. Harmonics are played by the violin over the theme on viola and insistent cello motif before the players push ahead, full of heavy pathos, to a coda that feels as though the music just runs out of energy. Weinberg was arrested by the KGB shortly after completing this work. It was only Stalin’s death and the intervention of Shostakovich that saved him. This is a strangely unsettling, yet very fine work. György Kurtág’s (b.1926) Signs, games, and messages, written between 1989 and 2005 can be played in any order. Here Ensemble Epomeo have selected seven of the pieces starting with Virág az ember that emerges from silence, hesitatingly before little notes appear. The dramatic Perpetuum mobile follows where Kurtag plays with the perfect fifth and thirds through a tremendous and highly absorbing sequence. The trio play dissonant harmonies in Ligatura Y before the music grows faster with astringent dissonances and outbursts. Jelek VI bursts out full of drama with sudden string chords ending suddenly. Sliding strings create odd sound world in Virág – Zsigmondy Dénesnek with ghostly echoes of sounds rising and fading at the end. Hommage à Ránki György has pizzicato opening as a rhythmic waltz theme is developed that oddly throws up memories of Weinberg’s string trio, before just fading. Hommage à J.S.B opens high in register as the violin and viola weave a theme over a pizzicato cello before slowly falling and weaving around before just coming to a halt. These are strange little sound bites of the composer’s moods and receive a very fine performance here. The Allegro molto opens with a violent insistent motif before quickly changing to a mournful viola theme. The number three is important here with three outbursts and three cadenzas one each for the players. The cello cadenza has a three note motif that is rather skittish. After the second outburst there is a forceful virtuosic violin cadenza before a melancholy viola cadenza. The music is shared around with harmonics and a theme that darts around between the players. Eventually the music becomes more restrained with a flowing melody rising in angst before the cello holds a high note as the violin and viola play with the three note motif. The second and final movement, Vivace starts with an insistent theme that is worked around the players, rising at times with strident chords but with moments of quieter yet equally insistent music. These players weave some tremendous sounds with the music soon becoming dynamic and insistent before quietening. But the opening theme slowly returns before the decisive coda. This is a work full of drama and vital ideas finely realised by this trio. This new release is a really fine collection of works from composers that experienced in varying degrees the turbulent post war years. Ensemble Epomeo provide first rate performances and are given an excellent recording, very detailed. There are excellent booklet notes from the Ensemble’s cellist Kenneth Woods.